The Male Unit and I love tattoo conventions. He had a rare Friday off work (after being named Employee of the Month! 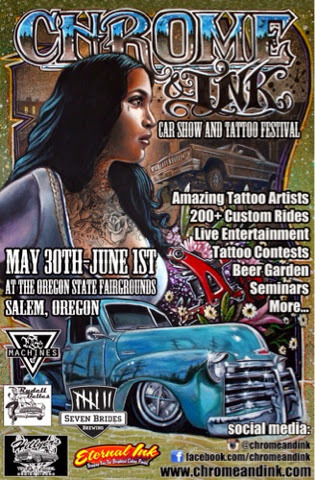 ), so yesterday we headed out to Salem, the capital of Oregon, and the first Salem Tattoo Convention. The convention was held at the Oregon State Fairgrounds building. Parking was close by, and at $3, a fair price. In addition, the convention featured many classic cars which were fun to explore and admire. It was a pretty good turnout, with artists from Oregon, Washington, California, Arizona, Nevada, Pennsylvania and Manchester, England. The emcee was entertaining, the contests were enjoyable and the company was fantastic. A local roller derby was on hand (and on skates) to help give out prizes to the winners. My only complaint was the complete lack of air conditioning...not a good thing for heat-reactive me. I made a rookie mistake by not calling ahead of time. It was made worse by my choosing to take a cane and leaving my wheelchair at home. My feet & legs are so sore...but it was so worth it. 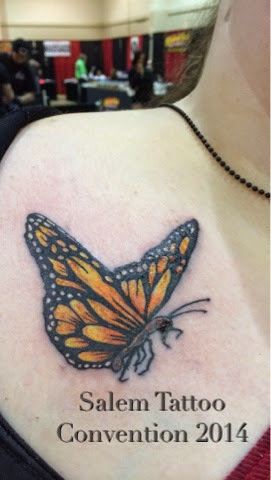 I have a convention tradition: I always get a butterfly tattoo. I'd like someday to be able to count how many conventions I've attended by counting butterflies! And yesterday was no exception. My other butterflies are on my legs, and are blue & purple. This time, I wanted a Monarch in all its orange & black beauty. I also decided on a different body placement: my first chest tattoo. After making the rounds and going through many photo books, I happened upon local Portland artist AJ. I love supporting female artists and was glad to come across one with exceptional skill. 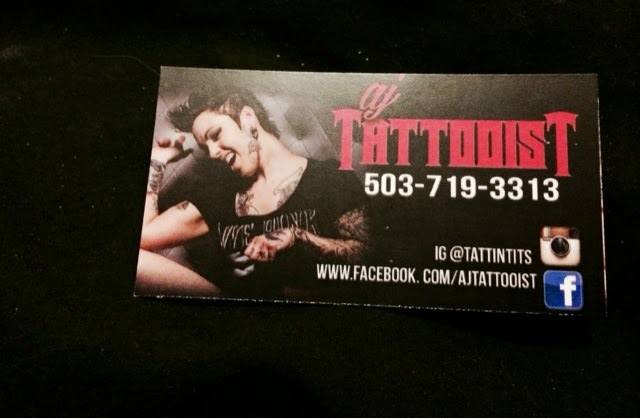 I was quite surprised to learn she'd only been tattooing for three years. Her level of proficiency usually takes years and years to achieve. And then I saw in her book a tattoo of morning glories. For years, the plan has been to have morning glories on vines on my left leg from foot to hip (I have them on my foot and ankle thus far.) AJ's morning glories were amazing. I was sold. I was immediately at ease with AJ and truly enjoyed talking with her. She reminds me of Joan Jett: a kickass, take-no-prisoners rawk empress. She has lovely tattoos along her jawline, and an impressive portrait of the late Amy Winehouse on her leg. It wasn't just ink talk: AJ's had an eventful life! I enjoyed hearing her talk about her days in the military and life in a post-Katrina Louisiana gulf coast town. I had read how the small towns and cities devastated by the hurricane were ignored in favor of rebuilding New Orleans, but it was interesting (and poignant) to hear it from someone who lived it first-hand. While doing the prep work for my butterfly, I talked ink with AJ's assistant. 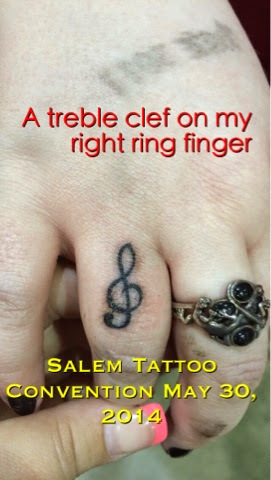 At one point, I mentioned that I intended to get a treble clef on the knuckle of my right ring finger in honor of my orchestra teacher in elementary school, Mrs. Oldham. To my surprise they offered to throw that one in! I had not intended to get that particular design today, but thought, "What the hell. Sounds like fun!" For years, he has wanted to get tattoos in honor of our three kids. 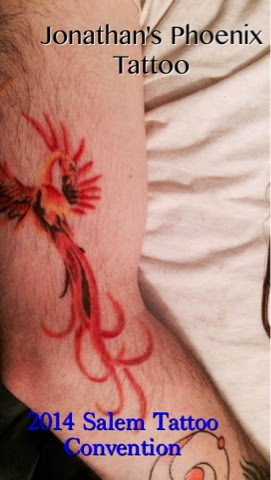 He finally began to work towards that goal, with a fiery forearm tattoo to symbolize our firstborn, Phoenix. When he finished, he came by AJ's booth and watched as she was putting the finishing touches on my butterfly. Because of its location, this meant Jonathan saw my new tattoo before I did. The look on his face told me all I needed to know: it was fabulous. When I got to look at last, I had to agree: it truly is beautiful. I love it, and can't wait to get more ink from AJ! 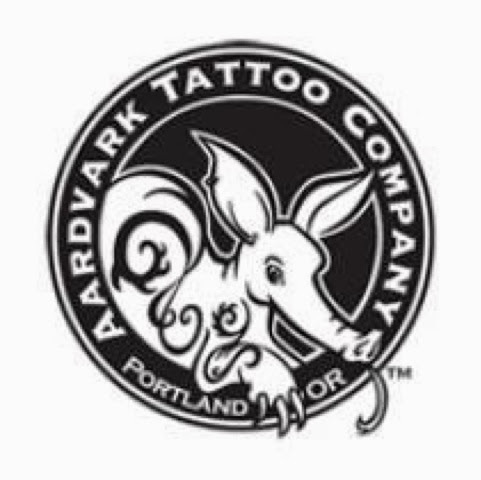 A funny realization hit my husband on the drive back to Portland: for the first time in our loooooong relationship, I now have more tattoos than he does! As far as I am concerned, this means he needs a new tattoo for Father's Day...in the spirit of fairness & equality. Thanks to everyone who made this convention possible, and a special thanks to AJ and Lance! You both ROCK! I am going to mama-brag for a moment, and as a result I will no doubt embarrass my daughter, Serenity Singer. But I am her mother, and it's my prerogative. She reminds me so much of my own mother, whom I lost to breast cancer when Wren was just a toddler. She inherited my mom's gorgeous, dark green Irish eyes. Wren does exceed my mom's eyes in one aspect: the naturally dark, curly lashes she gets from her father. They remind me a bit of Elizabeth Taylor's. She also inherited my mother's elegant hands. When I was a child, I would watch my mom write and just be fascinated by her hands: long, graceful fingers and natural French-tip nails that many women would (and do) pay a small fortune for! I am so glad to get to see those hands again, in her granddaughter. But those are just the externals. Where my daughter really takes after my mother is in her nature: kind-hearted, a loyal friend, a sardonic sense of humor, a love of cats and books and tea. And above all, her sensitivity, her generosity, and her strong sense of empathy. Sometimes, it's like a piece of my mom remains here, in her granddaughter. And I am thankful to G-d for it.